If you’re a curly girl, it’s likely that you have a love-hate relationship with your hair. One day, you’re flaunting gorgeous, bouncy spirals and waves. The next moment you’re battling frizz and curls that seem to have a mind of their own. Don’t give up! Your curls are in good hands at our New Orleans hair salon, and we have several tips that can help you fall in love with your hair again! Believe it or not, your fingers can be one of the best detangling tools! You can also use a very flexible wide-tooth comb to gently work out tangles. Brushes, on the other hand, can cause curly hair to become frizzy, and should be avoided. To detangle, start at the ends and gently work your way up, loosening knots and tangled sections. Be careful not to pull or tug at your hair in the process. A gentle moisturizing shampoo and conditioner is the best option for keeping your hair hydrated and frizz free. Over the counter products often can be your hair’s worst enemy as they are laden with chemicals and sulfate cleansers that can strip your curls of precious moisture. Look for products that are sulfate free for best results. Sulfate free shampoos will cleanse your hair gently and allow your hair to retain natural oils which protect it against frizz and dehydration. One of the stylists at our hair salon in New Orleans will be happy to guide you to the perfect cleansing products for curly and wavy hair. 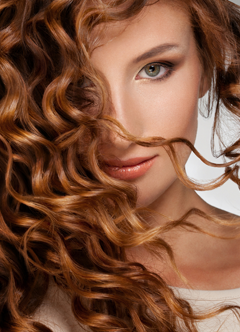 Curly hair craves moisture, and the curlier your hair is, the more hydration it needs. To give your hair a boost, choose a moisturizing conditioner, and then leave a small amount of the product in your hair instead of rinsing it completely away. This helps to provide extra curl definition and softness. You can also opt for an actual leave-in conditioning product. Most leave-in conditioners are light-weight, and they will keep your curls quenched and keep frizz at bay without weighing your hair down.